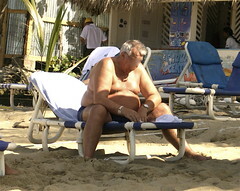 Image by colros via FlickrI happen to be not a huge fan of all-inclusive resorts. After moving down to Costa Rica and becoming a bit more involved with the environment and the simplicity of how many of the families live in the rural areas I have a little different view on all-inclusive resorts. Although I can't say the same for everyone. There is a new large all-inclusive resort in Guanacaste and the one good thing about it is that it is about 6 hours from San Jose. It is called RIU Resort which means I dont have to drive by it on my daily commute. I happen to feel Costa Rica is not a country that really needs all inclusive resorts. It just doesnt make sense for the vibe of the country. I was reading this one honeymooners blog on his visit to the RIU resort which you can read here and I love the part where he says it is a cruise ship that never leaves port. Well that is good to know considering cruise ships are the single most largest polluting peices of junk to our oceans we have (except for BP I guess). So I guess if you absolutely have to stuff your face for 24 hours then an all-inclusive is better than a cruise. My point is if you are coming to Costa Rica there is so much to do and you are missing so much. I always here the excuse its our first time, we dont know Spanish, drinks and food is whats really important to us. Well if that is whats important they save yourself a few hundred bucks and drive down the street to the Waffle House with a bottle of Whiskey in your coat because they run 24 hours. But if you want to experience Costa Rica for what it really is get out and meat the people and the places. Pump your smiles and dollars into the part of the country it should be going!